Q: I cannot seem to able to re-arrange pages within a PDF document using drag and drop, how can I solve this issue? A: If you’re seeing error message, it is most likely that your document is protected with a password and limited permissions or with a digital signature which prevent any page manipulation. You can verify this info by going to Document Properties (File -> Document Properties). Under Permissions section, Document Assembly is not allowed. 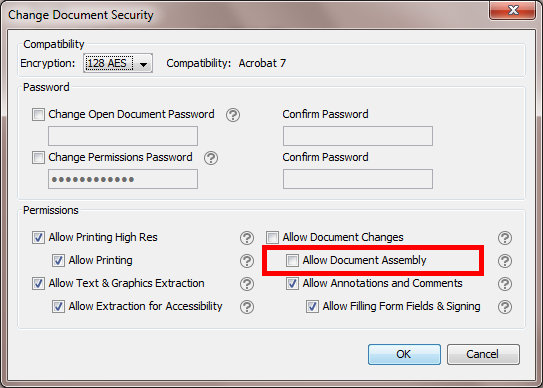 Click Edit button and observe that the permission “Allow Document Assembly” is un-checked. If you know the permissions password, you can change the document permissions. Go to Document Properties (File -> Document Properties), select Security and click Edit button, make sure “Allow Document Assembly” is checked. Save the document and try to re-arrange document again. If the document is signed, you can clear the signature before re-arranging document. This will invalidate the signature. To clear the signature, right click on signature field and select Clear Signature. If the document contains both permission password and open password, make sure to open the document with the permission password so that you can re-arrange the document. 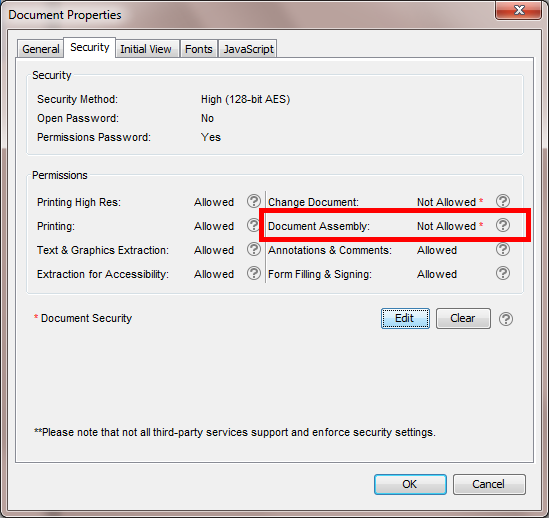 Opening a PDF in PDF Studio with the permissions password will unlock all permissions when editing a PDF document.